Beautifully engraved certificate from the Consolidated Virginia Mining Co. issued in 1949. 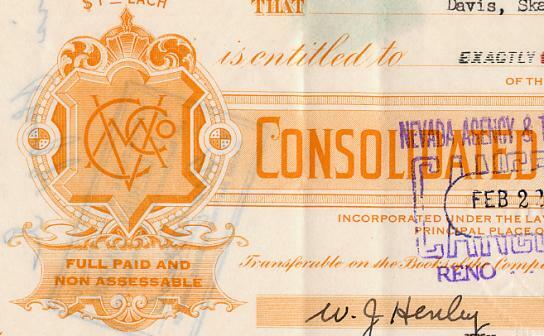 This historic document has an ornate border around it with a vignette of the Virginia Consolidated Mining company logo. There is a green 50 cent US Internal Revenue stamp affixed to the reverse. This item is hand signed by the Company's President, Zeb Kendall and Secretary and is over 56 years old. Zeb Kendall, who was a founding father of "Goldfield" and a renowned promoter around Tonopah. His brother was the first murder victim in Goldfield (over a mining claim). Zeb also promoted Rawhide (Nevada). A notorious gambler, he lost a number of small fortunes. In the 1930's, he bought up much of the Comstock tailings and, with a superior milling process, proceeded to make yet another fortune. SENATE RESOLUTION�Inducting Zebedee "Zeb" Kendall into the Senate Hall of Fame. Zebedee "Zeb" Kendall, a well-respected mining pioneer, civic leader and Legislator, is hereby inducted into the Senate Hall of Fame of the Legislature of the State of Nevada. The Consolidated Virginia Mining Co. on the Comstock Lode at Virginia City, Nevada, was organized in 1867, but the sinking of a shaft was delayed for two years. The lode was difficult to find, work stopped, and the stock fell considerably in 1870. In 1871, James Flood began to buy stock in Consolidated Virginia and, joined by John Mackay, James Fair, and William O'Brien, formed the Bonanza Firm. They bought the land owned by the Consolidated Virginia Mining Co. and hoped to find rich ore in that section between the Gould & Curry and the Ophir mines. In 1873, they struck the Big Bonanza, which produced over $100 million of ore from 1873-82. The firm bought control of the adjoining Ophir and Mexican mines in 1877. Although the firm dominated the Comstock from 1876-95, when Mackay sold the interests to San Francisco stockbrokers, the last dividend was paid in 1880. The Con-Virginia was the most successful mine on the Comstock and one of the few to pay more in dividends than it levied in assessments. In the 1930's, the company was reactivated to mine and mill the lower grade ore still remaining. The reactivated firm in 1933 collected old maps and also made detailed new maps of the older workings, level by level. These 112 large rolled maps (which include one signed by Charles Frederick Hoffmann) show various mines and mining claims on the Comstock Lode in addition to Con-Virginia. Some high-grade veins were found and production continued until 1942 when gold mining activity was curtailed because of war-time restrictions. After this time, the mine operated only sporadically and correspondence ceases in 1955.